*Pure Encapsulations dl-Phenylalanine is a combination of the well-tolerated essential amino acids, d-phenylalanine and l-phenylalanine. Together, these compounds promote mental functioning, support a positive outlook, and relax the musculoskeletal system. l-Phenylalanine is a precursor to tyrosine, which converts to the neurotransmitters norepinephrine, epinephrine, dopamine and tyramine. Tyrosine and its metabolites may support emotional well-being, memory and learning. Pure Encapsulations d-Phenylalanine may promote the levels of certain endorphins, thereby calming stressed muscles and joints. 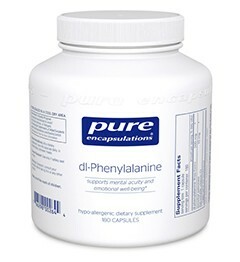 By maintaining healthy tyrosine and endorphin levels, Pure Encapsulations dl-phenylalanine nutritionally supports mental acuity and emotional well-being, while relaxing stressed muscles and joints. Pure Encapsulations recommends 4–6 capsules per day, in divided doses, between meals.